I was hoping storm Aileen would wreck one or two seabirds locally (i.e anywhere north of the Thames - as I really didn't fancy a midweek trip to Staines Reservoir). 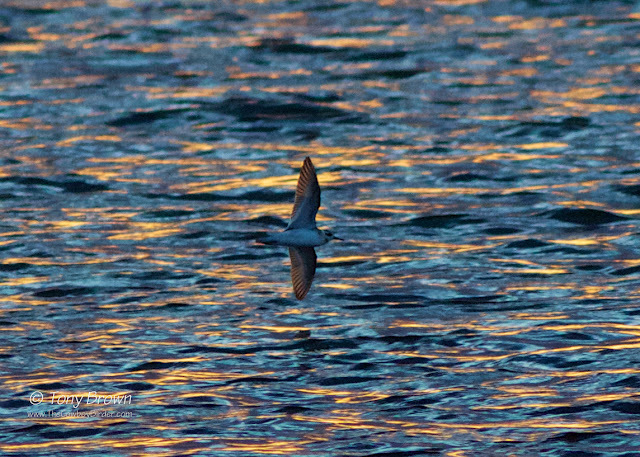 And as widely predicted a Grey Phalarope was discovered the following evening on the south basin of the KGV Reservoir. The bird was briefly seen again the following morning and then not reported for the rest of the day, despite the lack of news I thought it was still worth a look - as these small waders can easily be missed amongst the rippling wave-breaks whipped up by the wind. So I hooked up that evening with the birds finder (Neville Smith) and he soon picked out the bird distantly in the the north-west corner of the south basin, the rain was starting to fall and the light was fading fast so we hurried quickly around the reservoir to try and get some better views, all the time the bird was constantly being hounded by the Black-headed Gulls and would settle briefly on the water before being chased off again. By the time we reached the north-west corner the bird was now mid-reservoir and after even more harassment from the Gulls, gained height and we thought the bird this time had had enough and was off! But it circled around and landed on the south-side of the reservoir, by the time we had walked around this side the sun had almost set creating a wonderful mixture of blue and orange reflections across the water. In the fading light we left the bird as it had finally settled on the water and was earning some much needed respite from the Gulls and although the views were never the best, it was great to finally get one of these magical seafaring waders on my London list.